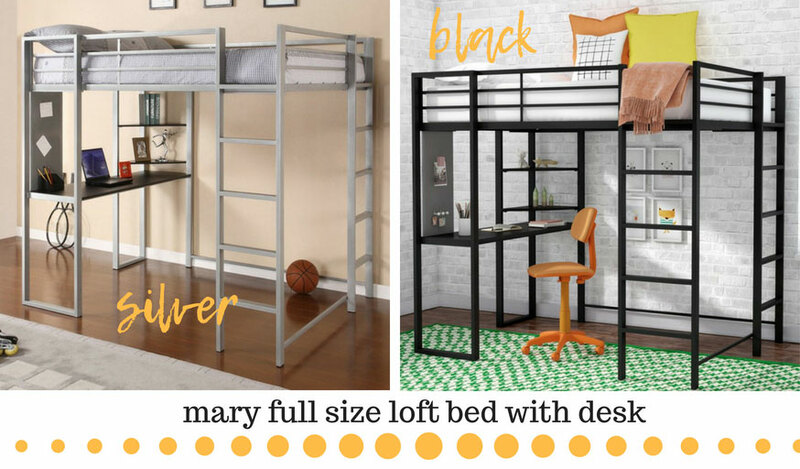 Find A Full Size Loft Bed With Desk Underneath: Perfect for Small Spaces! Whether you live in a studio apartment, a college dormitory or need a bed for a small bedroom, full size loft beds with desk underneath is well-worth considering. Powell Furniture Z Metal Loft Bed: 300 lb weight limit! 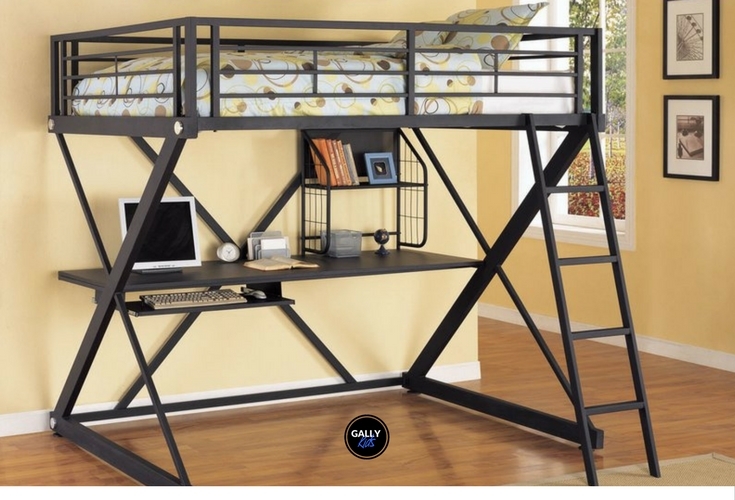 Rachelle Workstation Loft Bunk Bed with Desk: Loft Bed that Holds 400 lbs.! 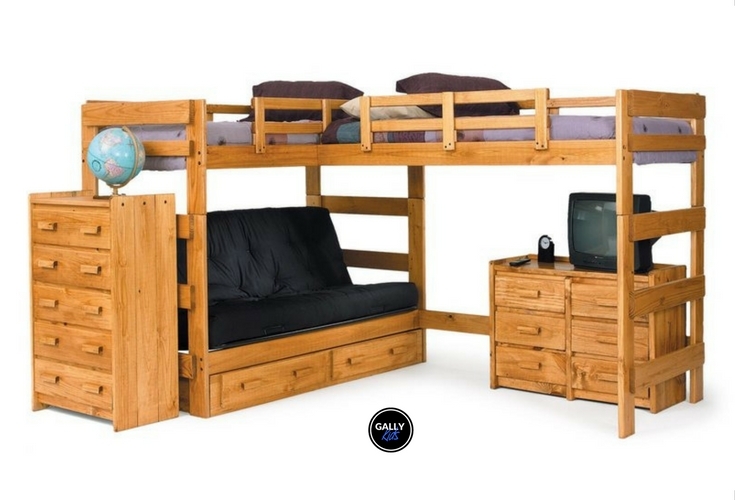 Heavy Duty Full Size Loft Bed For A Studio Apartment or Kids Bedroom – With a whopping 500 lb weight capacity! 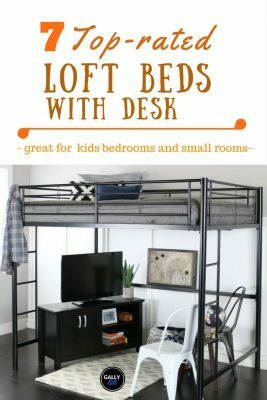 Want A Loft Bed at A Budget Price? You’ll Like These! With a front to back measurement of 57.5”, it’s one of the smallest ones in the market. This makes it the perfect bed for small rooms to maximize space. The room will have a lot more area for other furniture if that’s what you want. If not, it opens the space a lot giving it an airy spacious look for a minimal design. The desk underneath is part of the package. You don’t need to buy it as an extra accessory. It is designed in a way that leaves more space for other things under the bed. 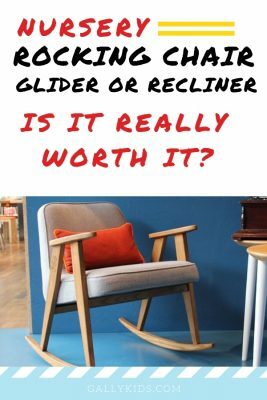 You can add a couch or a futon, drawers or even another table if that’s what you want. This is a high loft bed. It measures 72” (6 ft) from the bottom to the top of the bed slats. You’ll find that it has a lot of space underneath it. This is very useful to maximize the space underneath the bed. But because it’s tall, it is not suitable for rooms with low ceilings. If you want to make the most of a small space, this will not disappoint. You will need at least a couple of hours to install this bed. Have someone with you to assist. Parents say their tween easily helped with the assembly. 300 lbs weight capacity / 136 kg. A white loft or bunk bed is a popular choice for many parents and kids. 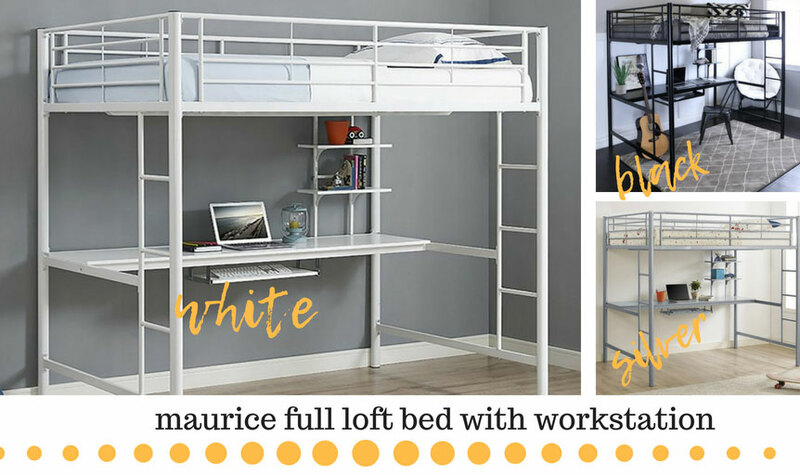 You can see why this white Viv & Rae’s Maurice Loft Bed with work station is one of Wayfair’s bestselling loft beds. It looks very clean and sleek, doesn’t it? Apart from the white color, another reason you’ll want this for you or your child’s room is the big desk. Since it goes from side to side instead of front to back, it uses a big workspace that measures 76” x 18.88”. There’s also a sliding desk for the keyboard making this the perfect study or workstation. The headboard and footboard are 15” high. This means there’s a lot of space to put a thick mattress on. In fact, the recommended mattress size is about 9” (which is 3 inches more than the Mary bed above. Read Maurice Loft Bed Customer Reviews. Check it out here! The Gabriel Epoch loft bed makes a perfect addition to a small kid’s bedroom. It looks good in both a girl or boy themed room. This classic full size wood loft bed is made of solid beech hardwood. You can choose from either a coffee or natural beech color. It’s a durable, sturdy and stable furniture that will last for a long time. 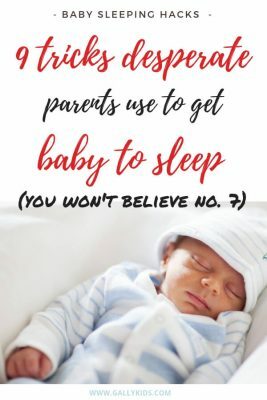 With proper care, you might even be passing this on to the children of your children! This is one of the few wood loft beds with a desk that includes all the necessary features a study area or workspace should have. There isn’t just a desk underneath the bed. It also includes mini drawers, cubby holes, and a corkboard! And if your child needs some more storage space, you can also buy the additional media cart which fits perfectly in that area. This is one of the unique features of the Gabriel loft bed. Many of the bed parts are adjustable and removable. You can easily remove the desk should your child not want it a future time. And you can also get rid of the loft bed if you just want to use the desk. The ladders are also adjustable. It´ss a very versatile piece of furniture that you can use in different ways. This beautiful wooden loft bed has most of the things needed to furnish a tween’s or teen’s room. The Harriet Bee Javin bed already includes a desk, book shelves, and 6 drawers. This bed has various configurations to fit your needs. For example, the drawers can be assembled on either the right or left side of the bed. This means that you can easily change it depending on the shape/size of the room or the location of the bed. The Javin is made of manufactured and solid wood (cherry and poplar). 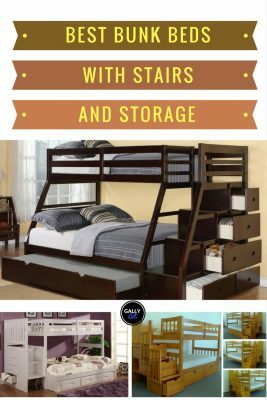 This combination makes it a strong and sturdy loft bed for kids. It doesn’t shake or wobble and your child will feel safe as she/he goes up the ladder to the bed. This is the perfect loft bed for a small bedroom. 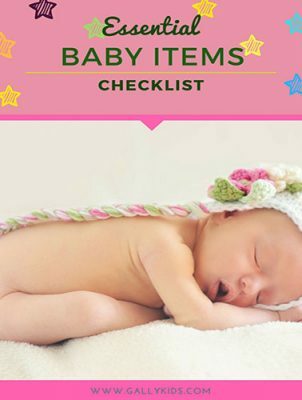 There’s a lot of space for things that a child uses regularly like books, stationery, and other school material. The drawers are spacious too and make the perfect clothing storage solution for a more organized room. 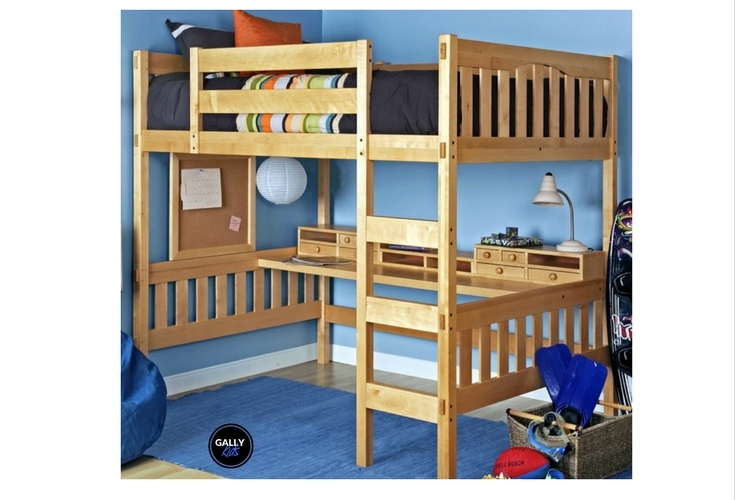 See what parents say about this loft bed, CLICK HERE! 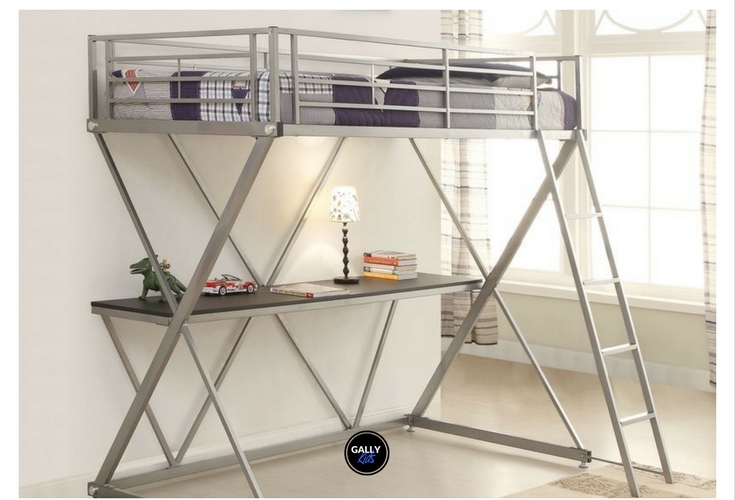 Metal Z loft beds fits bedrooms with a contemporary design. What makes these extra special than the other beds on this list is that they’re sturdy heavy duty structures. One loft bed even has a 400 lb. weight capacity. The Powell Z Bedroom Loft bed is a very stylish modern-looking loft bed that looks great in small bedrooms. 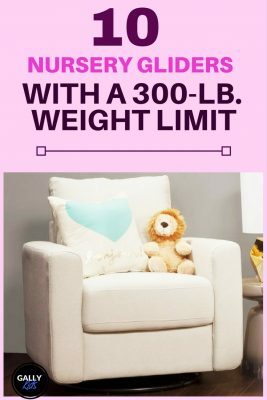 It’s sturdy with a 300 lb capacity weight limit. This bed/desk combo is a great space-saver without sacrificing aesthetics. The black finish looks very polished too. The built-in desk has a mini bookshelf and a nice touch is the functional keyboard drawer. The structure and design of the Rachelle Workstation looks much like the Powell Z loft bed above. However, the desk is more simple as it doesn’t have the keyboard drawer nor the shelf. It’s also a cheaper option. Don’t be discouraged by this small difference, however. This bed is just as stylish, as durable and as cool as the Powell Furniture bed. It even has a bigger weight capacity at 400 lb. This is also a little bit smaller, so if you want some extra space in the bedroom, check this one out. Would you rather have an empty space under the loft bed so you can customize it to your kid´s needs? Or do you want a full size loft bed with other furniture under it like a futon chair, a dresser or a trundle bed? Here are a few selections of full size loft beds without desk underneath. You can easily transform the space underneath the bed into a play area, a workstation, or a den with furniture that you already have at home! This bed from Chelsea Home is great for a studio apartment or a small room. This can hold 3 beds, so if you have children who share a bedroom, this is the perfect solution. It looks good and is very sturdy. With a weight capacity of 500 lbs., it can safely accommodate three people. If you wish to use only the top bunk beds, the lower bed can be turned into a futon as shown in the picture. Or you can make that whole space a workstation, storage, play or study area. And here is another modern design made for kids ( or grown-ups who like pink). As you can see, what sets this Viv + Rae loft bed apart from many of the other full-size loft beds on this page is that it’s pink. The desk/talbe is uniquely placed in the middle, too with the futon/cushion to sit on close to the table. And the nice surprise? The table can be easily folded and you can convert the seats to a bed for those times when friends stay for a sleepover. Very neat, huh? Finally, a white full-size loft bed. So why do I say this? While researching for this list, it hasn’t been easy to find one in white. But finally, the Maurice Loft bed in white! And you know what makes this even better? It’s on sale for under $300! The Maurice loft bed is perfect if you’re trying to save space. Put the sleeping area on the top bed and there’s more than enough space underneath. It could be a desk, a play space, a storage area, a small sofa! 1. How much weight can a loft bed hold? Different loft beds have vastly different weight limits. One loft bed can hold 250 lbs. while another can hold as much as 1000 lbs. One important thing to remember with loft bed weight capacity is that that number not only includes the weight of the person but also the mattress in it. 2. How high are loft beds? There are no official guidelines on how high loft beds should be. One important requirement though is that there is enough space under the bed that can be used for other purposes like a storage space or a desk. 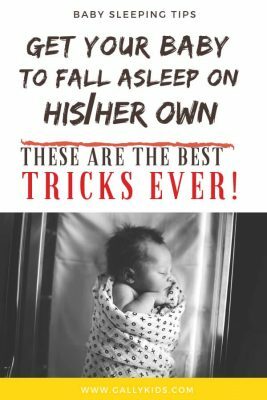 Apart from this, you also need to make sure that there is enough sleeping space from the mattress to the ceiling. The beds featured in this list have an overall height between 4’5″ to 6’5″.  Turn the space into a den: Since there’s a lot of space under the loft bed, you (or your child) can turn the space into a den or study area. Some things that others have added include a dresser, a sofa, and another bigger desk.  Hide the mess: This isn’t just a bed, it’s also a great place to hide the mess in your kid’s bedroom! All you need is to put a curtain around it and voilà! A nice lovely bedroom space that your child can also use as his own sanctuary!  Make it cozy: Decorate it with fairy lights.  A great idea: Get remote control lights. This way, your child can safely go up the ladder to at night. Another suggestion is to add a storage caddy that hangs on the side of the bed for books and other stuff. Instead of remote control lights, you can also add a lamp attached to the wall near the bed. If you want more kids bedroom ideas, here are some more ideas for bedroom furniture that look great in kids rooms.